There are lots of reasons a clean house is important to me, but the biggest is probably simply that my brain works better when my house is clean. Over the years I’ve had lots of people ask how I keep things tidy most of the time. So–at the risk of having you all think I am completely crazy–I thought today I’d share my little “speed cleaning” routine. I probably spend, on average, about 45 minutes to an hour each morning making my house sparkle. This means I spend about 5-7 hours a week cleaning. That is still a significant amount of time! However, to me it is well worth spending 5-7 hours a week cleaning in order to have a house that is pretty darn neat & tidy most of the time. The trick is staying on top of it. I am a list kind-of girl, so I actually have a daily checklist that I use each day. It is located on my “control center” wall where I have a dry-erase monthly calendar and where there is also a spot for a weekly meal plan and important phone numbers. Since it is all in one place, I can easily check the calendar for any pressing activities or appointments. This helps me prioritize my cleaning activities and to cut things out or add things as necessary. I don’t use a wide variety of cleaning supplies, and I have never been that picky about brands. I used to use a lot of commercial products, including the disposable wipes, but I have slowly transitioned to using mainly these homemade green & thrifty cleaning products. They are cheaper, they smell better, and require me to keep far fewer bottles of stuff lying around! The two commercial items I do use frequently are my Swiffer Wet Jet and my Swiffer dusters. What a great invention! It makes mopping so much faster & easier. Cleaning is much easier when everything has a home. Work on creating organized storage for all of the things that end up being scattered around the house, like papers, mail, shoes, & toys. Use a large laundry basket to collect items such as toys or clothing that need to be returned to a different room. If you have multiple offenders, use multiple baskets. After you have finished tidying every room, take 5 minutes to put away the collected items. Save sweeping/mopping and vacuuming until the end, then do it all at once. We have mostly hard surface floors, so I use an industrial dry mop to wipe the floors each day. It takes only a couple minutes to run it over all the floors and then shake it off outside. About once a week, I do a really thorough sweep and then use a Swiffer WetJet to mop. I vacuum the rugs about 3 times a week. Likewise, save the glass cleaning for the end as well. Once the house is completely clean, I will grab my windex and rag and run around doing spot checks on the glass doors and windows. I wipe the bathroom mirrors as well as the fixtures and sink. Keep daily shower cleaner in the bath/shower and spray down after each use. Store your toilet brush in a container of bleach; replace the bleach once a week. Use a duster or dry rag to quickly dust all surfaces, including the headboard and footboard. Use disinfectant wipes or a wet rag and disinfectant spray to quickly wipe down the sinks, tub, and shower. Use toilet brush to quickly scrub toilet, rim, and seat. Use disinfectant wipes or a wet rag and disinfectant spray to wipe down toilet seat & surrounding floor. Use duster to quickly dust all surfaces. Use damp cloth to wipe down furniture (if leather), table(s), and dining chairs. Tidy desk area and make sure all paperwork & mail is filed & sorted in its proper spots. Quickly unload (if necessary) then load diswasher. Spray all counters with disinfectant spray, then use soapy water and wet sponge to wipe them all down. Clean glass surfaces & mirrors as needed with glass cleaner and a lint-free rag. Don’t forget to spray & wipe the bathroom fixtures for extra shine! Put away items collected in baskets while cleaning. It may take a little getting used to, but once you are in the habit of speed cleaning each morning, you will be done in no time and free to enjoy a clean house for the rest of the day! Great tips, Ruth! I've been pretty slack about cleaning the house lately, but once again, you've inspired me! My struggle is laundry and my master bedroom and bath. Any tips? Laundry is so bad that I have piles and piles!! great tips! thanks for the follow. i am following you back too. These speedy hints would be even easier if someone did them for me. Michelle-I got both boards at Target for about $8 each. I also got the little magnetic pen holder there as well. I usually print 12-16 checklists at a time, then re-print when needed. Oh Ruth! You make it sound so easy! I wish I had more umph to actually do it cause you have it laid out perfectly! Great job! Love all your ideas and tips!!! Bookmarked. It takes me forever to clean as I ATTACK instead of cleaning. However if I attacked once then kept up with this list it could be easy and painless. I love your “control center” where do you keep it? So glad to read about someone who cleans using cleaning products that are bought! This morning as I was wiping down the dust bunnies in a bathroom I was thinking, “Why am I doing this? Using those Swifter wet or dry pads would be so much easier.” Oh the cost! Oh the guilt because I am older now and want to not be cleaning all the time and hate feeling the pressure of spending or not and homemade or not and the list could go on. I feel free…on my way to the store now!! Thank you for sharing your cleaning system. Your organization is inspiring to people like myself who are an organizational-wanna-be. 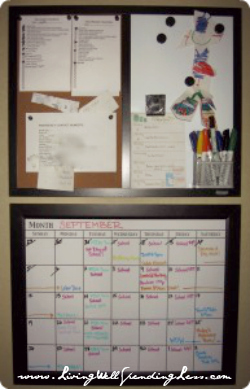 Would you also mind sharing your Daily and Weekly Checklists photographed in your Command Center? Thanks! Great idea. I need to try this. Now to teach myself to focus on it and not get sidetracked along the way. I love having baskets for each room to help with the clutter! Thanks soooo much! What great tips! I don’t mind the 45 minute routine, just can’t figure out how to keep clean the inside of the refrigerator, toaster oven, microwave, etc. in that daily process. I work from home as a Graphic Designer, so I don’t have much time in my day between kids and work. Speed cleaning HAS to be my method, but I find the “deep cleaning” an issue. Any helpful tips from those who have to work and keep up with the house as well? The fastest and easiest way to clean the inside of a microwave (no matter how messy it is) is to take a small bowl or mug, put some water and a splash of lemon juice or vinegar in it. Heat the bowl/mug for a couple of minutes and then let it sit for a couple of minutes and let it get nice and steamy in there. Then you simply need to wipe down the inside with a wet sponge or cloth. You probably won’t need to scrub anything because it comes off that easy! Yes! I tried this method for the first time a few weeks ago and I was absolutely amazed at how well it worked. I’m planning to put it to the test on the community microwave at work one of these days, as soon as I remember to bring in some lemon juice. I spray mine down with a mix of Castile soap and water and let it sit while I’m doing my dishes I also throw the glass plate in the dish water to soak while I wipe down the counters. I use that spray for everything and it works wonderful! Try to prevent cleaning as well as cleaning efficiently. For example, if you bring fewer things into your house, there’s less to clean or move around when cleaning. Can you use covers when microwaving, etc? Start with great cleaning products, like Bar Keepers Friend, Scrubbing Bubbles (if you can stomach it), and Krud Kleaner. Either deep clean one room a weekend at a time, preferably with helpers, or just focus your time on cutting clutter, then hire somebody to clean your whole house (a room at a time if needed) so you just have to maintain it. Use a mini-vacuum to clean up sma. l messes and dust. Keep the bathroom fan clean so it doesn’t blow dust around that turns into mud when it gets wet. Use an automatic shower sprayer and toilet cleaners that you put in once a week and they clean when you flush. For food that sticks onto pans when you cook, take out the food, then fill the pan with hot water and maybe a little bit of dishsoap. Put it back on the turned off burner while you eat. The hot water plus the heat from the burner while it’s cooling down get most of it off. Wipes also help a lot for maintaining between cleaning. You or someone in your house can take a 5 minute “Walk with Wipes” around the house and just clean up anything they notice. You can do the same thing with a duster or the mini vacuum. I also love a Roomba (robot vacuum) that I bought. I thought it was kind of dumb at first because who can’t spend a few minutes vacuuming. But now that I have it, I run it much more frequently and it gets up a ton of dust and allergens that I don’t then have to spend time cleaning off of everything else. It’s also fantastic for hard floors, because very often vacuuming is enough to save a mopping job. If you include most of those items in your quick daily wipe-downs there isn’t much need for deep cleaning because they are always clean. I do throw away old items and wipe the inside of my refrigerator clean before we leave for our weekly grocery shopping. If a drawer or shelf really needs work I take it out and clean it in the sink then lay it out so that it is dry before we come home, but that doesn’t happen often. For other deeper spot clean items I often work on them while preparing dinner. While something is cooking I use those little few minutes at a time to do things like wash the microwave platter in the sink (and wipe under it while it’s drying), wipe spots off the cabinets, wash the trash cans, clean part of the freezer, wipe off the top of the frige, etc. I find that since I’m on top of them, it takes no time at all to do. Hire a house cleaner to do heavy cleaning twice a year Spring and Fall. Keep up weekly with dusting, vacuuming and mopping floors. Great tips! I love them, thank you!! LOVE this post! I would be very interested in your checklists as well. Thanks! First, I’d like to thank you for sharing all those useful tips and your life experience. You truly are an inspiration ! I am a parisian girl, soon to move in a beautiful house we just bought with my fiancé. I couldn’t be more excited and I now spend hours on pinterest, reading about organizing and decorating. I found your post about speed cleaning amazing but I do have a question. I work full time and have a 2h commute every day. Between cleaning, cooking and grocery shopping, I don’t have that much time. Any advice on how to stay on top of things with a busy schedule ? Thanks again for this wonderful blog ! I hope I haven’t made too many mistakes in this comment. I try and improve but English isn’t my first language. Your English actually seems very good. I would not have noticed that it isn’t your first language if you hadn’t said so. Congratulations on the new house! He can and should help too. Been married 57 years and first thing we do everyday on getting up is make bed. Pick up after your self immediately ( this applies to both) and get dishes out of the way immediately after a meal. Any suggestions for a large house? Like 4500 sq ft with 4 bathrooms? Even just wiping down bathrooms/sweeping floors/countertops takes hours! We moved here last year from a 1600 sq ft house and I still haven’t found a good system (also we own a business, have 3 small children + 1 on the way, and we homeschool:). Any advice would be greatly appreciated!! I have the same problem – house is about the same size with 8 people living in it. We both work from home, care for elderly family members at home, and have 4 kids under 3…I honestly can’t keep up with the cleaning, it’s just meals, basic tidying, and laundry for me. The only way I know to survive with a big busy house and not spend every waking minute cleaning is to get a house keeper (or better yet, a nanny that cleans! *dreaming*)! Also with a large home here, 3700 sf, I am just choosing not to have things perfectly clean all the time. I COULD do this system every day but I don’t want to spend 1 hour every day cleaning; there are other ways I would like to spend my time. I do obsessively vacuum my hardwood floors downstairs where I spend most of my time with my DC59 because of the constant dog hair and crumbs from my toddler, and a few other things, but it’s a personal choice how clean to have a house. For me, it’s just not critical to have it this clean every single day. Do you work? As in not someone who stays home? I love, love, love your web site! You are inspiring to live well, frugally 🙂 thank you! Hey Ruth! My dauhter- in-law pinned this article and I was going to repin it since I can always use tip for speedy cleaning. Imagine my surprise when I opened the link and saw your smiling face… Good for you! Hope all is well! Hugs to all! It’s the best of Fly Lady! I guess you are FLYing. Yes, this system is quite similar to Flylady. However, she doesn’t recommend cleaning for 45 minutes a day. I tend to do my cleaning at night, but lots of great tips here! So what is your evening routine after kids go to bed? We tend to pick up and do dishes at night…which makes this “speed” cleaning seem even more manageable! Thanks for sharing so much with us!! I can spend 3 hours in cleaning every day and it is far enough from being clean. When I get through all the laundry and cleaning the kitchen after cooking and serving to 3 kids. There is hardly time for dusting. Detailed vacuuming of my entire house would take 3 hours if I didn’t have to pick up stuff of the floors. That included, would be 3 days. That would not work for someone who is at home with 3 kids that keep messing up 3 times as much as you clean and put away. Thanks for suggestions. Your comment of staying on top or ahead of the tasks is bang on. Waiting until the place is a disaster zone creates stress, procrastination and in the case of teens living with you, flared tempers. A small bit of maintenance every day keeps the place looking decent. I always have people say, “how is your place so clean?” the answer is, it’s always clean. your home is supposed to be a haven , a place where you feel peace. Walking into chaos will not provide that sanctuary. 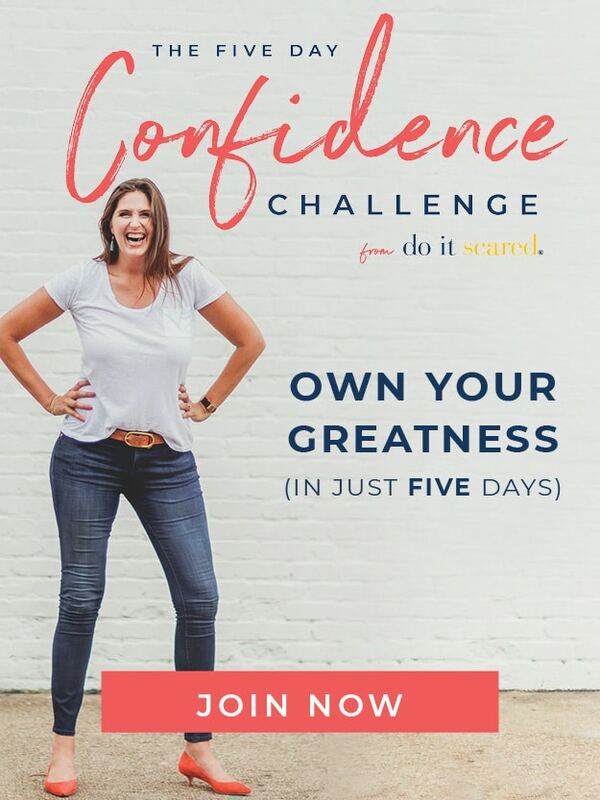 I really like what you’re doing here, it’s extremely motivating and inspiring….however I feel like your timeline is really, truly unrealistic. 15 minutes to do your kitchen, five minutes to clean your bathroom! I don’t get it, I’ve never cleaned my kitchen in 15 minutes when there are dishes still there unless your kitchen is already clean :/ Inspiring becomes discouraging when people try to copy you and realize there’s no way! Is impossible to clean a house in a few minutes, if you really want to keep it clean, you need three or four hours a day, three days a week..
A house is an universe, and “home” is an endless path you may walk”… for ever. bye. 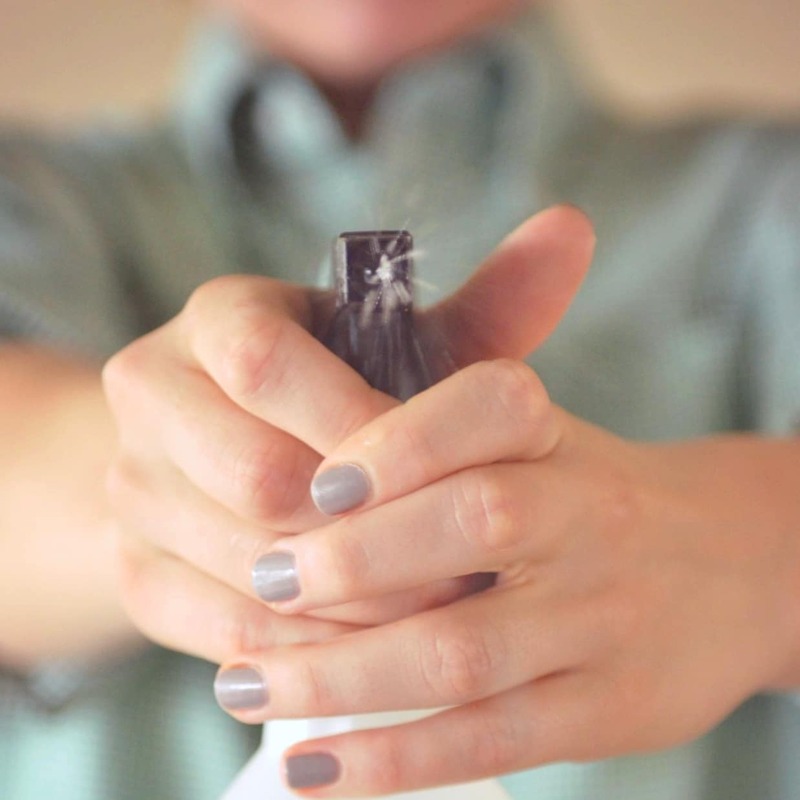 How To Keep Your House Clean in 45 Minutes a Day <Liked it! I clean mirrors, windows, toilet seat with rubbing alcohol. Got this tip from a friend who worked I’m a medical office. Leaves glass and mirrors streak free. Exactly whjere are your contact details though? Have you told us more about your control center? If not, I’d be interested in hearing about your set-up and how it works for you! This really grossed me out in the Bathroom section: “Use toilet brush to quickly scrub toilet, rim, and seat.” As a professional house cleaner I can only say you are introducing your family to some really gross germs if you use the same brush, cloth or whatever on the seat as you use inside your toilet. I use toilet paper sprayed with a disinfectant like Lysol or even pure rubbing alcohol in a spray bottle and do the final wipe down with that and flush it down the toilet. No messy rags and it leaves it much cleaner. Otherwise I enjoyed your routine and I always say the same as you “stay on top of it” it’s amazing how easier it is. Thanks for sharing. I always keep my brush in a solution of bleach that I change out regularly, then I wipe down the toilet afterwards with a separate rag. It keeps the germs away and my bathroom clean! This scares me– I thought you can’t mix bleach and toilet bowl cleaner!! You can mix bleach with toilet bowl cleaner IF cleaner contains bleach slready, is free of ammonia and/or is an a natural cleaner (check green cleaner ingredients). Bleach +ammoni = mustard gas. In the next step she said again to wipe the toilet sink with the rag or wipe. I thought the using the brush on the seat was a mistake because if I did it would spray all over. Great tips!! I do something similar that helps me keep up on the “deep cleaning” projects at home without spending hours and hours on the weekends or at night. We have a big older home, wood floors in every room and vintage tile that needs more attention than a quick swifter can do. I have daily cleaning tasks that differ each day of the week ((ex. Mon – sweep/mop all floors, shake/vacuum rugs, start laundry. Tues – Deep clean bathrooms/finish laundry. Wed – fold/put away laundry. Thurs – Dust/clean windows. Friday – Deep clean bathrooms again and laundry if any)) I do these chores along with daily straightening/organizing throughout the day when I can and cleaning the kitchen after each meal, etc. I came up with this after becoming a new mommy this year and it has saved me! I was so overwhelmed trying to juggle everything and anytime I would sit down to relax, I felt guilty thinking of everything I had to do or “could be” cleaning! Now I only have to think about what I have to do each day and stay on top of it. When the cleaning task is done for the day, I don’t feel guilty about relaxing for a few minutes!! Emily, I like your approach… I read this article and thought the tips were great but “life” happens and cleaning is NOT a priority even if I would like it to be. I think we all need to approach caring of our homes as an ever evolving process and as our kids grow so should they start taking on jobs appropriate for their age to learn that all those under one roof have a part to play in the general upkeep of their home. We will never have a Better Homes and Gardens home IF you really are living and enjoying family under that roof. Your kids won’t remember that their rooms were always tidy or the living room was spectacular BUT they will always remember the times you finger painted with them or read them a story or took the time at night to tuck them into bed and listen to their rendition of their day. Thank you Emily for putting some real life perspective on this. You are amazing!!!! This may actually help me. I am now a stay at home mom of a 3 year old and 6 month old and am having a hard time keeping up on the cleaning. I feel like I am always feeding someone, cooking or picking up after 4 people constantly and then there is no time left for the real cleaning. Does it cost anything to follow you and your advice? Is there a cost to subscribe to your “advice” column? Thanks for the tips. Keeping my house clean is a constant struggle because I get so overwhelmed. I never thought to carry a basket and fill it with items that belong in other rooms. Love it! I clean a room at a time, a lot like you see maids to at hotels. A basket to catch toys, laundry, dishes or other items that do not belong in the room…I sit it in the doorway. A plastic bag hangs on the doorknob to catch trash. A utility basket to hold my cleaning supplies, cuts down on running back and forth. And an apron with three pockets…one for loose change (it does pay to clean, lol), second for papers that are not trash, and third pocket for small items that would fall out of your catchall basket. If I cannot clean a room in 5 or 15 minutes, it means I have a lot of items and need to prioritize my time or reduce clutter. With a collection of over 300 bunnies, they do NOT get dusted every day. I do however, dust one fourth of the room every day, and just keep rotating. You can tackle daily chores and make one day a dusting day if that is your choice. Think about it, make a plan and try it. See what works for you!!! ready for work. Which means 3 hours early. That’s too much!! Good ideas though. So you shouldve seen me yesterday making my own control center excited and proud…not an hour goes by before my 3 year old and 18 month old push a kitchen chair to the wall its on and see they have ripped all my papers down and have colored all over my wall. This of course was happening while explaining to my 5 and 6 year old what it was and why i made it. I love the thought of speed cleaning. I have 4 bedrooms and 3 1/2 baths so it will take me more than an hour. I also speed clean but just a little different. I clean certain bathrooms on certain days and the same with dusting bedrooms. I like how you begin with the master bedroom which is the most important room of the home. Hi Ruth! I love this and am going to start this plan on Monday. Do you have a printable for this? Thanks. Love it! 5-7 hours a week seems like an inordinate amount of time to spend cleaning! Admittedly it’s only hubby and I in the house, but I would never need to spend that much time cleaning. Of course, my idea of clean and yours may be different 🙂 If things are tidy, dishes are done each night, items are in their place, nothing’s crawling around or growing mould, I’m happy. My daily to-dos are: if you’re finished with it, put it away; make the bed each morning; give one section of the shower a scrub with the in-shower cleaner while I clean myself 🙂 ; clear and wipe down the table after dinner; wash the dishes and sweep the kitchen floor before bed; put rubbish and recycling out as soon as the bin is full; dirty clothes into the washer or hamper as they come off (colours straight into the washer; whites get separated for later); run the washer when full (overnight using a timer to save time and money); put away dry dishes and hang out clean washing before work; bring in clean washing after work (I fold straight from the line to save time) and put away (no one gets a pile to deal with later). Once a week – or less often if it’s not needed or I’m busy – dust and vacuum each room, clean the toilet and bathroom, and wash hard floors. Windows and exteriors get done a couple of times a year. This keeps everything running smoothly and I don’t spend half my life doing housework. I totally agree with you. I have NO desire to spend this much time cleaning and that’s ok for me and my family. To each their own, I just wish there was a bit more understanding that for some people, 5-7 hours in just cleaning is not realistic for many reasons. Cleaning an entire house in less than an hour is possible when you read this blog. I normally list down the areas that needs a touch up and group it into 2 and clean it every other day but if I have more time I do everything. Looking at the kitchen 10 to 15 mins….I just can’t see how you can even get two of those things done in that little time, unload/load the DW and handwash dishes. Seriously, it takes me 10-12 mins to unload and reload alone IF I’m not interrupted by the others in the household! Don’t know how or when I’d get to do the rest of the list for the kitchen during this speed clean session. BUT, I’d like to try! What do you use to spray down the shower daily? This printable is a great resource. I hope it helps! Thanks! do you use the bathroom cleaner as a daily shower spray like you would use Tilex or Clean Shower? I am also leery of using Borax for anything after reading about it on the Environmental Working Group web site. Yes,use the bathroom cleaner daily. There are definitely varying viewpoints on the use of Borax! I personally have read several articles about the controversy, and I feel perfectly safe using it in my home as a cleaning product, particularly when it is compared with other chemical laden products. Borax is a naturally occurring substance that doesn’t get absorbed by the body and does not harm the environment. Furthermore, the EU study you are referring to was regarding Boran being sprayed on crops. I am definitely not suggesting we use Borax in our food! 🙂 Crunchy Betty has written a fantastic article on the subject: http://www.crunchybetty.com/getting-to-the-bottom-of-borax-is-it-safe-or-not. forum you come across. Innovation needs organizational support to succeed. You really make it seem really easy with your presentation however I to find this topic to be really something which I feel I’d by no means understand. Nice blog. I’m a Graphic designer . Passionate of my work. Love fashion, have a few blogs. I highly recommend everyone to visit Adapt Clothing for a clean outfit for the summer. The best mop to clean hard surfaces is the I spin mop. I am able to clean very quickly and my hands never touch the water. The mop is made with micro fiber which picks up all dirt. I have three dogs and two cats and my home smells fresh always. This mop is the best invention I have come across. FYI, that bleach solution you’re storing the toilet brush in is pretty much kaput after a few hours. Sodium hypochlorite is the disinfecting agent mixed with water to make what’s known as bleach and the chlorine component will off gas when left open to the air, leaving you with something that doesn’t disinfect at all. You disinfected the brush after a few hours of soaking, so you can rinse it off if you like and let it air dry. Dump the rest of that mess down the toilet or sink. Disinfectant is used up in the process of disinfecting, so there’s no point in keeping it for an entire week. This is just Flylady: control journal and routines. She says swish and swipe the bathrooms daily, clean the kitchen sink, do a load of laundry, do the dishes. Then there are daily zone lists to work in as you can. If you work outside the home, then do zone work whenever it fits in your schedule, buy her point is establish routines and don’t let the mess build, exactly what is said here. There’s no magic formula. We have to clean, and breaking it into regular daily bits will make it easier. Thanks for sharing your thoughts about speed cleaning. Very nice blog. It is very helpful as well. Thanks for all the general guidelines. It sure can help me about my cleaning methods and techniques. Thank you! May I just say what a comfort to discover somebody who genuinely understands what they’re discussing on the internet. run into any browser compatibility issues? A few of my blog visitors have complained about my site not operating correctly in Explorer but looks great in Firefox. I am sitting here with tears of joy! I have always needed some inspiration to get going on things and simplify cleaning, schedules, shopping, etc. I love lists and keeping things tidy, but I fall behind and then it becomes a mountainous project! This will make my life (and my family’s life) so much better! They say if you can touch one person then it’s all worth it, and you have sincerely helped me! Thank you! love your main blogposts, but I might need a good deal more insight relating to speed cleaning. You have a very well-organized cleaning system. That calendar chart is a notable tip! It will surely save and establish your time wisely. No wonder, you only spend 45 minutes cleaning your entire house. Those are great lists of cleaning supplies. They really deserve a try. Thanks for sharing those thorough steps, too. Impressive content and style of posting. I do think I’ll come back on this website down the line and see just what else you’ve gotten in store 🙂 !!! but suppoae you added a title thast makes people desire more? I mean Speed Cleaning | How To Keepp Your House Clean in 45 Minutes a Day is a little boring. Love this post! I feel like I’m always cleaning and our house is still a mess, I’ll have to try your method. It is also important to match the kid toys with the child’s developmental age (which could be higher or below their physical age. or around their play areas. Its much necessary to make a cleaning plan before cleaning your home. There are so many cleaning professionals which can clean your home in a better way. I’ll also try to follow your tips in my best. alsao create comment due too this good post. positions that you wish to offer protection with your home. your agility, and you also want for making it home safe after your workout. Installment of an invisible home security wireless home alarm entails significantly less labor and hassle and is also more economical. let you decide about the optimal safety plan and system designed on your house and life activities. for a sale you may well be able to get a tremendous discount. stove heats faster than gas or oil models, meaning your fuel time is lower. Hubby swore he did everything the same manner the directions said when installing. If you might be searching for any machine that prolong lifespan of your laundry, then this will be the one for you. seize the best APY calculator available on the market. LG appliances don’t Tweet however they do send text messages. There are special cycles for silk, hand washing, express wash, and sanitary wash.
A pulley consists of a rope that fits in to a groove inside a wheel. a washer inside a really number of years, this was a fresh feature. electronics, snowboard graphics, medical devices and displays. In rinsing using the pressure washer, you are able to apply three methods. in order to easily add these for the onscreen menu. cable provided with your TV that supports these ports. Life Foods, and Bobs Red Mill gluten-free flours. And bear in mind to set all appliances inside a radio configure on the identical wavelength. you or informed you, right. information is essential. Your computer will store the safety key it can be using to gain access to Wi-Fi. storage device or possibly a video recorder. washer is the way it moves the clothing, on the usual washer, they’ll use agitator, however with this machine they cannot. I strongly suggest this gas dryer to any consumer in need of a great gas dryer. used classifieds for both washing machine and dryer for an overall total of $300. This submit truly made my day. You can not believe just how much time I had spent for this information! Thanks! Bright Hub wants to make the whole process much easier for our readers in this collection of articles all focused on business plan writing tips with templates. premises in the building and then for any parking lots which can be part with the property. comes to image quality when viewed from locations remote. of H264 or also referred to as AVC (Advanced Video Coding). factory default settings it is going to be ready to become configured just as if it were completely new. Wi-Fi is today’s wireless capability component which is available in the form of your card that’s inserted to the computer. MIMO antenna system that handles at the very least three spatial streams on both ends. down the Wi-Fi since those colors often means on and off on different computers. So how to utilise these principles in one of the most stressful areas of our everyday life – money. their food, their culture, their language. freedom to become safe and emotionally naked on the same time. inside quest generally seems to doom the monorail. one that will help you finally feel relief. window or in the tail lights. mounting brackets. There are many models of emergency lights available today, and also the most prominent ones all is Light bar police vehicle. easily enable that you do this. believe could possibly be useful. LED TVs have LCD screens which use light-emitting diodes for backlighting being a substitute from the compact florescent lamps found in LCD TVs. so at this stage, inside your work with full 1080p is to use a Blue-ray disc musician. there is one thing that makes MURS different than anything else. will probably be obtained quickly through reputed firms. to ensure the migration to aspects organized and effective. battery also it comes along featuring its fast charger. operate without having to worry about cords and plugging inside your tools and for this form of tool produces a lot of sense. battery is entirely drained instead of having the energy fade over time. maneuver freely in various angles and positions. you should notice a discernible change in the speed where your locks appear to age. baldness which progresses in severity to include lack of eye lashes and eyebrows in severely deficient subjects. hair color through the inside out. Biotin acts as being a co-factor with all the other members in the vitamin B complex. Calendar using the appointment in order that it pops up a number of minutes before. That it’s more than a right, it’s duty, to be who you’re. Baofeng menu But using the ingress of all kinds of other sources, radios are accepted as one of the best reasons for entertainment with a huge crowd. They would not impose for us very strict regiments of how they wanted us to become. If one does go down this route, try to make life more bearable by keeping a confident disposition, especially in front of the kids. to afford. Dry CASE DC13 Waterproof Cell Phone Case (Crystal Clear) $ 30.
camera is absolutely very important as it saves poor and innocent people. camera is waterproof (usually when ‘W’ is in a very model name, that is what it means) around 20 feet. The best way to solve this matter is to get you a Zippo Style Spy Camera. the income along with put money into DVR card. and then this DVR will immediately deliver up that online video. white and also in colour. I pick up the living room at night, make sure the kitchen is spotless after the last meal and hang up clothes before I go to bed. Next morning make sure all beds are made. My husband helps since we are retired. Friday is deep cleaning day. My house is always clean and organized. But if a crises happens – illness, outside lawn care etc. things can get out of hand but we manage to get things back under control next day. Life happens! possible for you to to get all that trash into the dumpster simply earlier than it piles up. choose up and sufficient for numerous journeys to the native dump. Love your tips. So you have the same routine everyday? How often do you vacuum rugs, and do you put the bleach in the container that holds the brush and why is that beneficial? Your cleaning list is really helpful! The truth is that sometimes I forget certain nooks in the house, while cleaning and when I notice that I had forgotten these spots I am too exhausted to bring all the cleaners again! Thanks a lot for this article! I agree that the homemade cleaning products are great. If you clean quite regularly they work out to be more economical and something they are not as harsh as the commercial products. I have GOT to to this…for my health. I have had foot and knee surgery. I need a SAFE /clean /clutter free place. I can fall down, literally, if I do not get on track with this! Thank you for sharing. I am going to try this with my kids by giving them each part of the list, so we can do it even faster together. few subjects. Chat rooms, being powered by web applications, couldn’t support video chatting. It’s not a secret that purchasing share in the stock market is really a risky business. plan renting for at least an extra hour as events may extend beyond their planned hours. your laboratory and imported it from New Zealand. Hello, I want to subscribe for this web site to obtain most up-to-date updates, thus where can i do it please help out. It’s truly a great and useful piece of information. I’m satisfied that you just shared this helpful information with us. touches and gets to the intended audience. Huge discounts are also given under different packages on these places. direction but it just was no match for i – Movie Maker. and handheld gaming environment. There will also be a Combo Breaker Pack edition available which will give players the eight fighters from Season 2.
will also act as curator for the entire album. and beats options when you look around on ShineBeats. 2004. IGF-1 Extreme Factor Deer Spray can be a very purified water deer antler velvet extract. years ago. If you want, you can have a talk with some of their ex-students to know about the quality of their service. on a sound foundation of Driving Skills and Advanced Awareness without which a driving career can often be over before it has started. When my family was at home, after every mean I would take a minute to sweep the floor, always cleaned up my kitchen, in the evening I would start in the livingroom to do a quick clean up spray furniture with vinegar & water (natural deodorizer) a quick wipe down, same in dining room, washroom and kitchen…all would be sprayed. then a quick wash of the floors, do front hall way too…In the morning when I went downstairs to do my exercises I would do a spray, wipe down, vacuum start a load of washing then do y work-out when I was done it was time to switch washing to dryer, then wake up my family…after everyone left I had about 1/2 hr before I would have to leave, clean up the kitchen washroom, fold washing, as I left each rom I sprayed them with my mixture of vin. & water…this was done because my son was is allergic to dust and had allergies, and asthma! This is all pretty much what I do, but my schedule doesn’t allow the time in the AM, so I do my quick clean at night. Wow! I can’t imagine doing all those things every day. Dry moppin ALL the floors, the mirrors? I clean every day but wow! Thanks for the tips. This is a wonderful approach to cleaning which I will consider even though it differs slightly from my definition of “speed cleaning” which means tackling whatever looks dirty when I go through a room FAST. 45 mins, how is that speed cleaning? 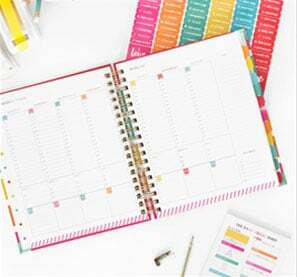 I do 15 mins in the morning 15 mins in the evening and an hour on the weekend—I know I could streamline and make it more efficient, but if these are the best tips out there….. It is so cool that you use natural cleaning methods! I love them! 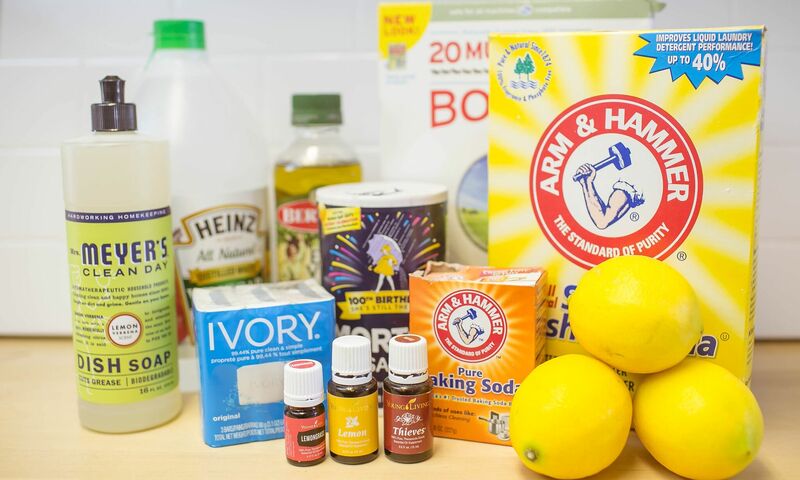 I clean only with baking soda, white vinegar, lemon and if I am in a mood a few drops of essential oils. Thanks for sharing your cleaning experience here! I agree that natural ingredients are a viable alternative to those nasty chemical based commercial cleaning products. You can’t beat baking soda for cleaning bathrooms and vinegar for leaving a streak free finish on your interior glass! Wonderful tips! I think the biggest tip is really to “stay on top of it”, thank you so much for sharing your experience! I take an empty spray bottle, fill 3/4 way with warm water & add 2 tablespoons of liquid fabric softener to clean my Windows, mirrors & glass top dining table. Finish with a microfiber cloth, and the clean sparkle results are stunning! Breathing bleach fumes is bad for your health all by itself. Add to this the risk of combining the bleach fumes with those of other cleansers. Simply not a good idea. Making the bed is essential. If your bed is a mess your mind will be a mess, too. These were my grandma`s words. I think she was right. Greetings! Waooo Great Post.Thank you for the tips that you are sharing with us.this method Save lot of time…..
Got to this post from you Christmas speed cleaning post. I loved the Christmas speed cleaning checklist that you created. Do you have one created for this “normal” daily routine? Would love to post on my fridge for the new year! Thanks for providing these tips on cleaning house. world famous schools, colleges and universities. Great article! It is informative blog.I need this information very much.These cleaning services are very useful and helpful to me.I am waiting to get more information from your site. Thanks for sharing this to all.. I have gone through your site its good and excellent. Hey! I have recently started following you and every post of yours inspires me to make stuff on my own. I have already started to apply the tips in my daily life. Thanks a lot! It’s a great post. Great tips, Ruth! I’ve been pretty slack about cleaning the house lately, but once again, you’ve inspired me! I totally agree with your viewpoint and I myself prioritize cleaning the place every morning. It not only helps me stay fresh but also saves me from the embarrassment in front of unexpected visitors. Speed Cleaning rules will help you to cut your cleaning time in half, so remember to follow them every time you clean. Any article or blog about cleaning always interests me because I am indeed a cleaning freak but these days I cannot able to do that due to my work predicaments. So, what I Do is, I contact Hicare whenever I need house cleaning services. Because they provide the best cleaning services of all time. Quite a handy guide! Thanks! Here Norlendatrip will help you with the ultimate travel as per your budget. We will take you to all the places that you must not miss and many discounts are also ready too. You did a Wonderful article about Home arrangements & Cleaning. Thank you so much. We got inspired from this article, so we decided to write our own version. We’re a team of professional cleaners based out in Seattle. We wanted to share some additional tips to help clean quickly and thoroughly at home. Here’s the link if you would like to check it out.